Why triathlon? I have always enjoyed fitness and have done many sports. I have never been particularly good at any, but have always loved exercise. When I moved to Australia from NZ I got really involved in CrossFit which I loved and still do. However, I always wanted to do more. 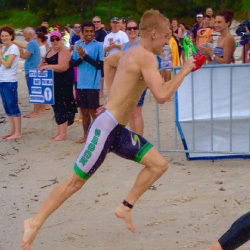 I then had heard about Noosa triathlon and thought, I want to give this ago. 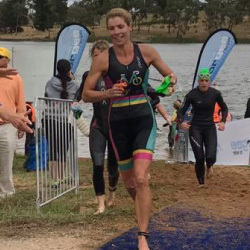 So I googled triathlon in NSW to see how I could enter my first race and Elite Energy came up. I signed up for Nowra, my first ever race. I loved it!! From then on it’s history. 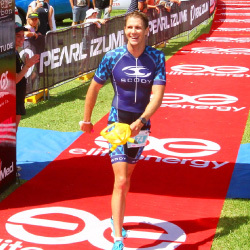 I have raced in over 5 Ultimate Elite Energy events and many other distances. Elite Energy provide me with many opportunities to race as well as have the best weekend away with my friends and family! Why triathlon? 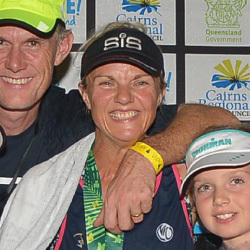 I ran a 10km fun run (bridge to Brisbane) completely untrained. This run almost broke me. I remember going out to lunch for Father’s Day after the run and I could barely stand up from the table. I ended up with blisters and could barely walk from DOMS in my legs for the next few days. After this and a bit of pre exposure from my girlfriends father the hunger to do a triathlon was there. Advice for newbies? Slow down. There’s so much to gain by slowing down. When asked why you do it you say? Challenge. Unless people are really interested I often don’t even try to explain. 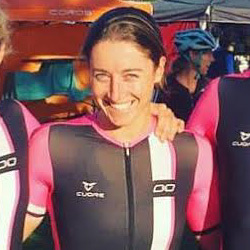 There’s an odd mindset amongst triathletes that most people don’t understand. When asked why you do it you say? It’s such a rewarding personal challenge, every race brings new lessons, and challenges to overcome. No two races are the same, and I love the room for improvement that having three disciplines brings. There’s always a race against yourself. Its’ also one of the few sports you can line up as an amateur and be out there amongst the pro’s. I couldnt sign up for an athletics carnival and be racing around with Usain Bolt! And… Just Because I can. To keep my body and mind active, challenged, and busy. And because one sport just isn’t enough. Best triathlon experience to date? They have all been good. I have travelled the world to train and compete and I think triathlon has made me a better person. I am still active despite turning 50 last year and I still set an active role model for my kids and other Mums. Training is like a door way into friendships and it makes me so happy to have other people join me in training and then in triathlons. We are closer friends as a result because we have shared passions. How I keep motivated? Something pretty simple, one day down the track, I want to be the best. So everything I do, no matter how insignificant it seems today in the big picture of things, is in pursuit of one day being the best. There’s a phrase that has become sort of my motto, something I live by, I can’t remember where it came from but it’s something that motivates me a lot to strive for success, ‘DREAM WITHOUT LIMIT’. .. That’s my focus and that’s what gets me through. There’s also a quote from Muhammad Ali that I really love and remember every time I need to get motivated through the tough times, “Suffer now, and live the rest of your life as a champion”. 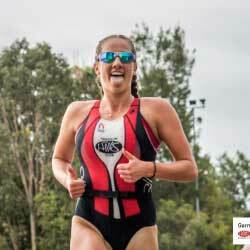 Worst triathlon experience? 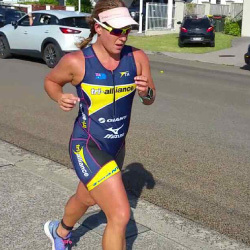 No triathlon experience is bad! 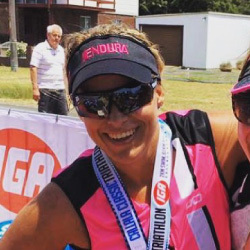 Best triathlon experience to date? Crossing the tape at Batemans 2016 was an amazing feeling. But I also remember crossing the finish line in my first tri, and I don’t think the feeling has changed much! It’s the little achievements you can take out of every race, even if it’s not been a good one. When asked why you do it you say? I love it! It’s a challenge, it’s social, I get to train with a cool bunch of people every day at Moore Performance.